We are excited to bring you our first featured blog from GO Rome today! 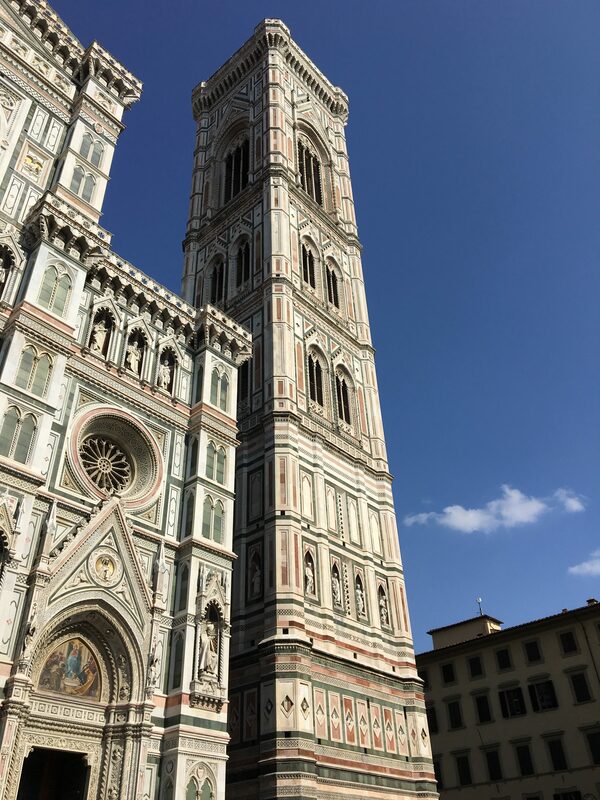 Emily Callahan, a student at Miami University, joined us in Florence for our first weekend excursion and had some adventures along the way! 463 steps is all it took to climb to the top of the Duomo Bell Tower and see the miraculous tops of all of the buildings, churches, and homes of Florence; their roofs glimmering from the rays of the sun that beamed down on the extraordinary city on that simple Sunday morning. 463 steps is all it took to walk on the same path as some of the most talented architects and artists of all time, their legacy living out in every inch of the tower. Looking down at the ground where their feet once stood, walked, and ran as they created a tower that has been standing longer than my home country has been around, was an experience that I will never forget. 463 steps is all it took for me to have one of the most cliché, yet life changing experiences of my entire life. Each view from the various watch levels of the tower put something new into perspective, and made me reflect on my life. My entire body was shaking as I climbed those 463 steps the top of the Duomo Bell Tower, and each step I took (literally) made me reach down inside myself and fight the fear that was calling me to go back to where I could look from below. But with each level that I got too, not only was another historic view of the city calling my name, but also something else that I hadn’t heard in such a long time, and that was myself. Each new view of the city made me realize that I should never take anything for granted and that I should seize every moment that I can, because all we have is one life. As I took each cramped, dusty step inside of the historic tower I felt like I wasn’t just climbing one of the greatest buildings in the world, but I felt like I was climbing back into my old self, the self that sought out adventure and adrenaline rushes, the self that took every chance she got to explore and try new things. My sense of wonder, adventure and love for what is “now” came back with every turn I took inside the steep staircases, and as I stood at the very top, with only a cool metal bar keeping me from falling, I was no longer shaking from head to toe, I was standing confidently staring out at one of the most beautiful skylines I have ever seen in my life. The way the mountains stood behind one another appeared like shadows, almost perfectly aligned behind one another, connected by tall trees that decorated them so delicately. Their distant, yet immense green leaves complimenting the yellow of the buildings, brown/red of the rooftops and the dark grey coloring of the endless streets. Everything looked so small, and the breeze that had just sent sweat running down my body, sent chills up my spine; nothing had every looked more beautiful. It was silent, the kind of silence that can only be heard at the dead of night when you are so involved with your thoughts that all your worries in the world seem to go away. It was the type of silence that allowed me to just stand there and take in everything that I was seeing and feeling, because I knew that I would never get those same feelings again. And that was when everything was put back into perspective for me, I was wasting away moments like this because I was so afraid of what could go wrong instead of realizing how amazing I would feel if things went right. Looking down at all of the people walking the streets of Florence I felt like I was a kid again, standing on the top of a rock staring down at little ants as they walked across my back yard. I then felt confident and excited about what was to come as I made my journey down the immeasurable tower, instead of feeling afraid of what I was leaving behind. 463 steps was all it took for me to climb to the top of the Duomo Bell Tower and have one of the most amazing experiences of a lifetime. 463 steps was all it took to find adventure, wonder, a sense of “now” and what I have been looking for, for so long now, myself.